Although the benefits of Early Decision applications to college are huge, it can be a costly mistake for families who don’t consider all the angles. 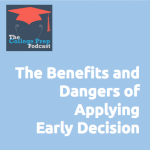 In this episode, Megan Dorsey turns a complex process about whether to apply Early Decision into a straightforward choice. Early Decision (ED) – ED allows a student to apply early for his or her top-choice school and receive early notification of acceptance. Typically, ED applications are due November 1, and students are notified of the college’s decision by December 15. ED is designed to allow students to apply to a single school; students admitted under an ED plan agree to withdraw all other regular-decision applications and commit to attending the ED school. This is a binding early option and is not appropriate for students who want to compare financial aid packages or other offers of admission before selecting their college. Restrictive Early Action (REA) – Many families are hesitant to apply ED because it is a binding decision; REA is a non-binding alternative. Under REA, students apply to one school and receive early notification, but the offer of admission is not binding. Students get the benefit of an early response from their top-choice school, but they have the freedom to compare this offer of admission with other offers made later in the year. Families have until May 1 to make a final decision, which allows time to compare financial aid and scholarship offers from other colleges. Early Action (EA) – Early action, unlike ED or REA, has no restrictions or required commitments. Students simply submit applications early and receive early notification with no further restrictions. A more flexible option, EA is not binding, and often students apply to more than one college under this option. Next in the episode, Megan discusses the benefits and dangers of applying early. Benefits include peace of mind and higher chances of getting accepted at high tier schools; a significant danger includes having to choose a school before knowing exactly how much you’ll be spending on that school. Megan provides some tips for thinking through how to decide which kind of early decision application is right for you. If you’d like to work directly with Megan to get your questions answered about whether or not to apply early decision, schedule a consultation with her.